This one started out from a reference photo, and while I meant it to be a quick sketch it turned into an actual illustration. Sometimes it happens like that. No screen cast as it was all sort of accidental. Thanks MB. I am a bit worried that it’s going to go from “sketch” of the day to “illustration” of the day, which are two very different things. My goal was to just set aside ten minutes or so a day to just sketching, being loosey-goosey about it and just practicing on whatever caught my eye. I don’t want it to turn into a formal full-on publication-ready illustration thing. Sketches aren’t finished works of art, they’re just quick studies, like doing scales or just jamming in music. Or throwing the football around. That kind of thing. But this one just happened to turn out nicely, so what are you gonna do. It is a lot different sketching on paper with a pen or pencil, and sketching on the computer where you’re basically inking everything. This is great Jeff. If I could create something even half as good as you can I’d be very happy. Also is that reference shot of Summer Glau from the Sarah Connor Chronicles? I think so Anarchangel, the link in the post goes to the reference image and I know her name is Summer. I haven’t ever seen the show and didn’t know who she was, though. 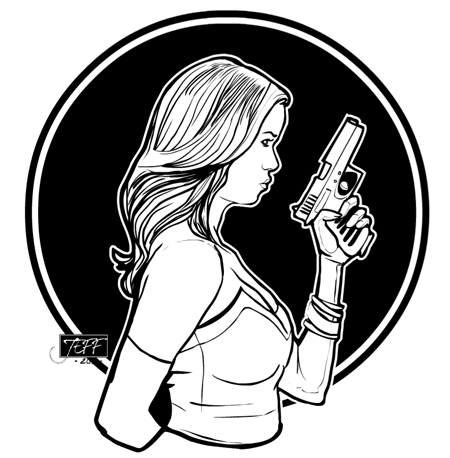 Sweet it totally made me think of Summer Glau when i saw it even before i saw any comments or knew about the reference image, i am also a fan of Summer Glau, she rocks. She is picking up steam too in the amount of work she’s getting. Shame on you Jeff, haven’t you ever seen Firefly? No, actually I haven’t. I did see “Serenity” (the movie) though. Also (get your long knives ready), I have never seen an episode of any “Dr. Who” series. Ever. Of any iteration. Consider my nerd card revoked, right? If you’ve seen Firefly, then Summer Glau is River Tam the little girl/killing machine. And her likeness is spot-on. Wow.